There is nothing like being out in the wild. The great outdoors makes everything seem better. Whether you are going out for a hike, hunting, boating, skiing, fishing, or anything in between, becoming one with nature is just a more healthy option than any other activity.That is why we enjoy our outdoor excursions, but even when we are away from civilization, we might come across situations where we need to keep in touch with our friends, family, and the outside world, especially when everyone is dispersed all over a mountain. For that, two-way radios comes in handy.There are many best two way radios are in the market and we have tested quite a few models and compared extensive list of features for better buying decisions. With all the smart phones and other wireless technologies we have today, you might wonder why you need a two-way radio. However, when you are out in the middle of nowhere or the ocean, you will find that those other forms of communications will fail every time. Only two-way radios are rugged, lightweight, and compact enough to do the job. When out in the wilderness, you want to reach people quickly, especially during an emergency. Only two-way radios have the convenience to reach people immediately. You never need to dial a number with a radio handset. You just have to push a button to talk or just listen to her your friends and family. As long as they are listening on your radio’s channel and they will hear you. They will instantly know that it is actually you that is calling as well. Radios use your own voice to signal your call. There are not telemarketers or unauthorized contacts either. You also control who is in and who has access to your radio communication group. This is a major advantage of two-way radio systems. You can call everyone in your party at the same time. Everyone can stay on the same page without miscommunication or having to repeat the same information to different people, saving time and money for everyone. Now that you know why you need a two-way radio system on your next adventure to the outdoors, you need to know what you need to look for when buying one. While all radios come with some common features, not all handsets are the same. They each have their pros, cons, and design purpose. Obviously, a radio with more features will cost more. So, you might want to go with a more basic model if you just want to keep track of your family and friends while on a mountain. However, you may want them if you work outside and need them for any reason. Size and weight – Two-way radios come in all shapes and sizes, but you want the one that fits your hands and backpack. Generally, that means you want one that is light and compact. You may also want one that comes in an ergonomic shape if you need to use them with gloved hands. Calling and Paging Tone – Some radios let you send a calling alert tone to inform others of your incoming call. Some models only have audio tones, but you can also find a few that can vibrate. Channel Scanning – Every radio on the market lets you scan through the available channels to find your group or to locate an empty channel. Key lock – Key locks protect your setting while you go about your business. VOX and Hand Free – Voice-activated (VOX) features let you operate your radio with just your voice. You can use the VOX feature with or without a hands free adaptor, making it perfect for when you cannot stop to answer a call. You should look for radios with jacks for microphones, headphones, or microphone/headphone combos to use these features. NOAA Weather – Many radios lets you tune into the NOAA weather band stations for local forecast and conditions. GPS – While none of the radios in this review offer it, some high-priced two-way radios also come with GPS navigation. These RINO (radio integrated with navigation of the outdoors) units let you broadcast your position to anyone listening to your frequency. Batteries – Every radio uses a battery of some kind. Most radios can run on AA or AAA batteries or rechargeable nickel-metal hydride (NiMH) batteries. Others come with their own rechargeable battery packs. Either way, you have two types of radios to choose from. FRS (family radio service) radios are low powered devices that operate in the half-watt range. They have 14 broadcast channels, but they are not meant for outdoor activities. You are going to want GMRS (General Mobile Radio Service) radios. GRMS are high powered devices for outdoor recreation, broadcasting between 1 to 2 watts of power. They can communicate over FRS bands as well as their own giving you a total of 22 channels at your disposal. You will need a 5-year family license to use a GMRS radio which you can easily get for $90 from the FCC if you do not already have one. Nearly every two-way radio can transmit up to 25 miles, but only under optimal conditions. That includes clear, unobstructed line of sight between radio operators from high vantage points and good weather. Your actual range will depend on the local conductions and power wattage you use. Generally, a good radio will give you 2 miles of clear signal range. Just remember your body can block radio waves. So, you want to attach your radio to your pack that is fathers away from you to reach the best signal reception possible. Measured in watts, radio power helps define a radio’s effective range. While the GMRS radio protocol allows for up to 50 watts, you only see this at base stations. Recreational handsets usually stick to 1 or 2 watts to keep their size and weight low, giving a maximum range of 8 to 25 miles. High power radios work better in coverage shadows behind hills or buildings, but are otherwise no different than low powered devices. They are also more expensive and use more battery power, so you need to decide if you need the higher signal strength before you buy one. With only 22 channels, radio frequencies fill up quickly. You may end up with complete strangers listening on your conversation. For this reason, many two-way radios come with a set of privacy codes and a continuous tone or digital coded squelch system (CTCSS or CDCSS) to subdivide radio channels even further. You might still have a few unwanted people in your conversations, but these privacy codes can eliminate most of the extra chatter you would normally hear. If you need more privacy, you want a radio with interference-elimination codes and noise filters as well. Fortunately, all radios come with a monitor function that lets you check for clear channels if you do not want to use these extra features. Finally, you want to know if you can use your radio in the country you expect to be in the most. Fortunately, the United States and Canada share the same regulations and frequencies. So, any radios made for these countries will work in both, but Mexico only recognizes FRS channels. Other countries may have other restrictions if they use these frequencies for their local police, military or other government application. Also known as walkie-talkies, two-way radios are the alternative when you need to quickly call your people when you are out in the wilderness. There is no monthly contract or service fee. There are no overage charges either. You just get a free communication t9ool you can use whenever and wherever you are. Some people even prefer brining walkie-talkies with them on cruise ships and other exotic locations. Many business owners live by them to stay in contact with their employees out in the field and other job sites as well. This makes them popular among hunters, campers, skiers, and other outdoor enthusiasts though they also come in handy for families. Two-way radios lets you bring your kids along with you so they can enjoy nature as well. Just give your children simple radio handsets and let them play. You will always know where they are with a simple call. While you will find hundreds of radios on the market, we do not have the space to review them all in a single article. For this reason, this review will concentrate on four different two-way radio kits. 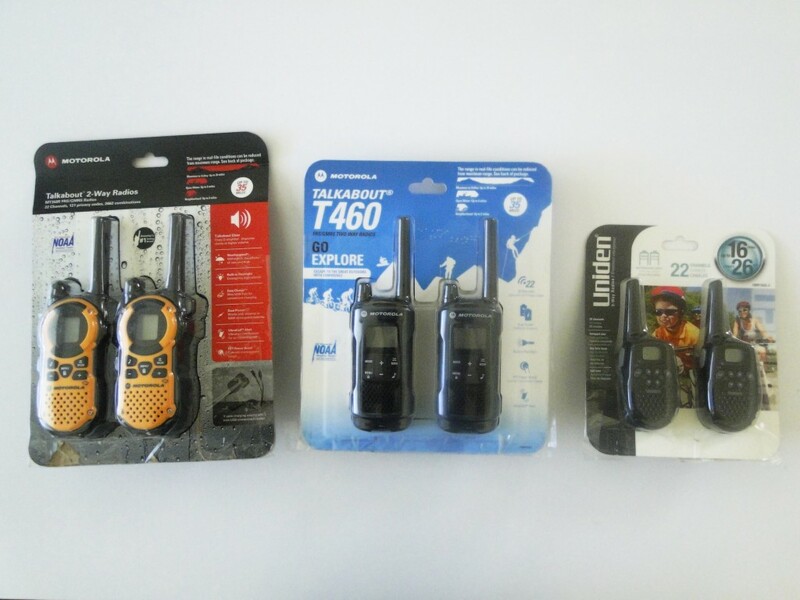 These radio kits are the Uniden GMR1635, Midland GXT 1050, and the Motorola Talk about models T460 and MT350R. These four kits have the features most people need to enjoy the outdoors. They all operate on both FRS and GMRS radio frequency blocks, which is great since you do not need a Federal Communications Commission licenses to use family radio service bands. You will find that all these radios have limited range and transmission power when operating in FRS, but these modes are great when you are just starting out and have to wait for your license to come in the mail. When that license does come in, you can then start really using these radios at their full power and range as well as the GMRS bands. Every radio in this review will let you talk with just a push of a button. You can then release that button to listen. Anyone listening on your radio channel will hear your conversations and you can hear theirs. Most of these radios also come with privacy codes you can use to create a sub channel for your friends and family if you need more privacy that you get on the normal channels. Before we continue, you must know that all two-way radios are compatible to each other. While two-way radios come in two-handset kits, you can use any radio to talk to any other radio on the market. Both radios just need to broadcast on the same channel, privacy code, and settings. That means you can use a full-featured radio handset for your self while giving your kids something more basic, and still be able to talk to them. You also do not have to worry about which radios your friends have. For this review we looked at a few factors that the average outdoorsmen might want in a radio. This includes how quickly someone can learn the various function of each radio as well as which situations these radios work best. We also noted any important extra you get with each radio kit such as NOAA weather forecasts, voice activation, and vibration alerts. We skipped texting and GPS functionality since none of the radios in this article has them. We did not check for transmission range because range depends heavily on local conditions. The manufacturer-specified range is only under ideal situations and are impossible to meet in real life. We did look at what other reviewers rated the respective ranges to gauge how well the radios would actually perform in the wild. While we did not go deep into many of the features, we hope that this article gives you the information you need to understand what you need in a two-way radio. If you need more details on what each radio can do, you will have to read the instruction and user manuals that come with the kits. Please note that you can expand most radio kits with accessories and headsets. Only one of the kits in this review comes with one in their kit, but you can get accessories for nearly all of them. You will just have to buy them separately. 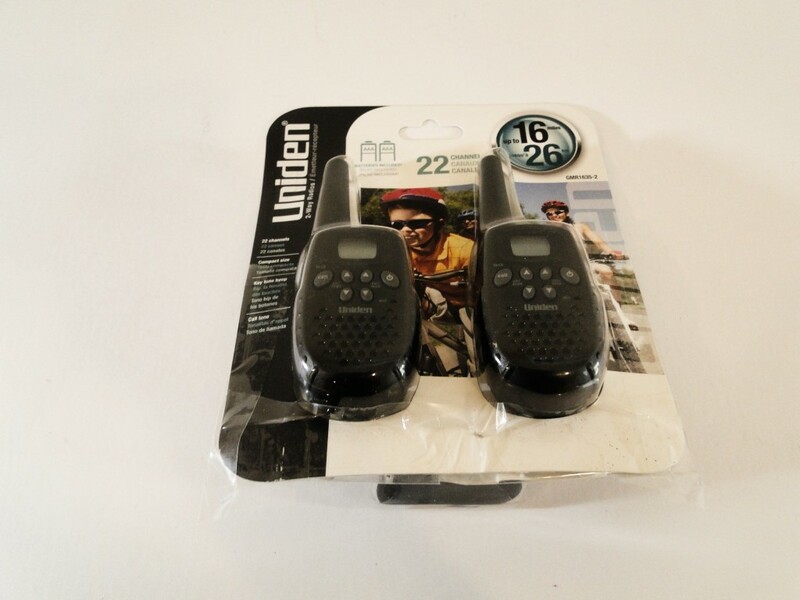 The Uniden GMR1635-2 2-Way Radio set is the first in this review because it was the easiest to setup. Each handset is fully powered by three AAA batteries which were provided with the package. Thus, I could use them immediately without having to wait their batteries to charge up. The Uniden set is also the smallest set in this collection. While they fit comfortably in the palms of my hands, they are tiny compared to the other radios in this review. They also have the fewest components. The radio set comes with the tow handsets, six batteries, and belt clips, and two instruction booklets (one in English and one in French), and that is it. Each of the handsets have only seven buttons and a small display window. Both have a power button that turns them on, as well as the usual push-to-talk button fixed to the left side of the device. They also have two volume control buttons as well as two channel selection buttons. The final button is the call alert button which sends a tone to the other handset when pressed. The small display shows the current channel, volume, and any currently selected functions. Each handset also has a microphone just under the power button and a lager speaker. These are clearly simple devices for simple needs. Like with any two-way radio set, you talk by pressing down the Push-to-talk button. During every test, the audio came in clear enough to hear. There was some static, but that could be from nearby interference due to my test location in an urban area, but I feel I could fix the static by choosing a better channel using the scanner. The set also comes with an automatic noise canceling system that blocks weak signals. The channel scanner lets you find open radio channels in the area. This allows you to find the other handset or any other radio broadcasting at that frequency. You can cycle through the channels manually, or let the device find something by holding down one of the channel select keys. You can do this any number of times you need to find the best and clearest channel for your needs. You can use monitor function to search for weak signals if you need it. The handsets even have a key lock mode if you need to secure the device for such situations. Is the Uniden set worth it? As I said before, this radio set has simple devices for simple radio needs. They let you talk when you need to talk without getting in your way. You just have to push a button and everyone listening on your channel will hear you. Still, these radio are ultra-basic. They have none of the features you find on other models. There is no weather coverage. There are no privacy codes. You can not control them with your voice or have them vibrate when calls are incoming. The best part is that you can use these radios straight out of the box. While you have to wait for the others to charge up, you can throw the included batteries into these units and just go. That makes them perfect for unexpected events, impulse trips, emergencies and other similar situations. It does burn through the batteries though. So, you want to bring extras along just in case. Most Uniden radios will eat through its batteries in a month with only occasional use. A few other users over the internet complained that they have to switch out the batteries every day, hour, or even a few minutes. Rechargeable batteries help, but prepared to change the batteries often. They are also small enough to fit in a child’s hands, making them perfect for your kids. That means you can use these radios to introduce the next generation of explorers the great outdoors! These devices are compact enough to take a few tumbles as well, so you do not have to worry about your little ones breaking them. This is a good thing since these radios are short range only, They are inexpensive, but you pay with a claimed maximum range of 16 miles. However, users claim the range is much shorter than that. Some even got only 1 to 2 miles in a suburban area, and some could not even get a half-mile out of these radios. Give these radios to your kids and keep them close to you. The Uniden GMR1635 is a fine first walkie-talkie for kids, but it is too restrictive for adults. If you are serious about your outdoor activities, try out one of the other radios in the articles first before you settle down with this one. 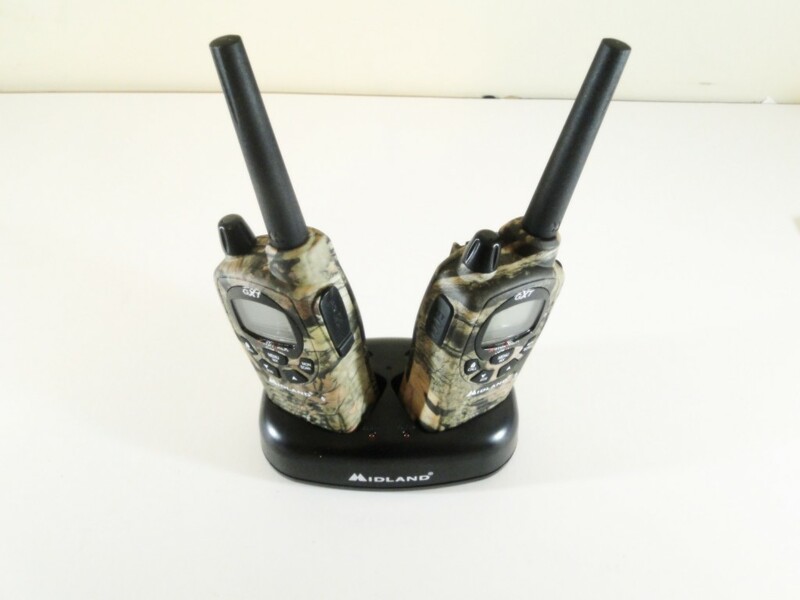 The Midland GXT Pro is the hunter’s two-way radio system. Adorned in woodland camouflage, The GXT Pro is reach with features one need when hunting game of any kind. Many of these features are standard on nearly all two-way radio systems, so you probably already know how to operate them without having to thoroughly study the instruction manual. Out of the four systems in this review, the GXT Pro was also the easiest to open. The entire system comes in a single, easy-to-open box. Nothing is glued together. This is a great feature as the box provides a simple storage solution when you no longer need to use the system, such as at the end of an outdoor season. One of the first things I noticed was the large power and volume switch. This is pretty standard on most portable radios, but the one thing that bugged me was that there was no indicator for it. It has a notch on top for the current setting, but nothing on the base to tell you how to turn it. The volume level is displayed on the display, but having something on top of the handset would great as well, especially while searching for it in the dark. The GXT Pro handset comes with 6 other buttons for various functions with the Push-to-talk (PTT) button being the most prominent. It is the large button on the left side of the device, easily accessible with any finger. The other buttons are for the call alert tone and key lock button, menu, channel scanner and monitor, and the two volume buttons. The lower volume button also doubles as an SOS switch, which sends out an emergency signal to the local 911 or emergency dispatch. The handset will also send out a loud siren to alert anyone nearby. The menu button is the most versatile, giving you access to all the devices features and setting. These modes include the channel select, privacy codes, signal power level, silent operation, call alert tone selection, hands-free mode, and much more. It will even let you cycle through the available NOAA weather channels in your area as well as turn on and off the weather alerts. The hands-free or VOX mode is a neat function to have. The system comes with two hand-free adaptors with a microphone and an earpiece, one for each handset. VOX mode lets you talk through the handset without pressing the PTT, which is great when your hands are busy holding a gun, another piece of equipment, or anything else you can imagine. The channel selection and scanner can read 50 different radio channels. The monitor function can scan two of these frequencies at once to help you find a clear channel you can use. You can then use the call button to send a tone, including many animal sounds such as a cougar, duck, crow, wolf, and a turkey. You can alert your friends of an incoming call while hiding from both man and beast. Either way, the sound comes in loud and clear. The speaker sounds better than a stereo system at time. After listening to the static coming in on the Uniden, the crystal clear GXT Pro is like night and day. I am very impressed with how good the audio quality is. The system even has a whisper setting that lets your whisper when you talk and still have your voice come in loud and clear on the other end. Another interesting feature is the privacy setting. It makes sure only those devices that share the same code can talk to each other. All others just get static, even if they are listening to the same channel. The GXT Pro two-way radio system is the key choice for those who just want to get away from it all. Heck, it even has a vibrate mode for all sounds and alerts. The whole thing is powered by either the included rechargeable NiMH battery or by four AA alkaline batteries. The system also comes with a charging stand that holds both handsets that supports a charging indicator light. It will take a full 24 hours to charge a completely empty battery, but it should only take 12 hours thereafter. As per usual, your maximum range will depend on the local terrain, nearby sources of interference and battery level. Your millage will vary, but you should get the best signals over clear open terrain such as over water, rural, and flat and level terrain. Either way, I was able to get a good distance out of the handset in the urban setting I did my testing. Out of the box, the first thing you will notice about the Motorola Talkabout radios is the screw that secures the battery compartment. While every other radio manufacturers use hooks or clamps to hold their batteries, Motorola decided to use screws. In fact, you have to use the screws since the back plate is just that a back plate. The screws are the only things holding it to the back of the handsets. This design choice is not a bad thing. It just means that you are not expected to replace the battery on these things. Good thing then that these Talkabout models comes with NiMH rechargeable batteries, even though you could use AA alkaline batteries instead. The screw also makes the set more water resistant. Both talk about models claim water resistance. You just have to make sure all ports are closed though. Motorola makes it loud and clear in the instruction manuals that should not add or remove accessories or the batteries when the units are wet. Either way, the units did seem to work well when I used them during a rain storm. Fortunately, both sets let you listen to the local NOAA weather forecasts so you can avoid the inclement weather all together. Both Talk about kits also come with an interference elimination feature. That is you can reduce any interference that may cause an undesirable operation of the handsets. This is a great feature to have when hunting or working in a noisy area. Just make sure that all your handsets have the same code setting or you will never hear your friends and family calling you. As for the handsets themselves, the Talkabout T460 comes adorned with 10 buttons and a power/volume knob. Each set has two PTT buttons, one for high powered transmission, and the other for low power. Connected together so you can click both at once, these PPT come in different shapes and sizes so you can know which button you press just by touch. Some of the other buttons include the industry standard channel select, call tone, volume up and down, and menu buttons. The Talkabout radios also come with an emergency call switch and a special mode button for when you need them. The final button acts as a switch for the built-in LED flashlight. The T460 is the simpler of the two Talkback models in this review. It uses a sleek, nearly rectangular box design, painted black with white lettering. The flashlight bulb is on tops of the handsets between the power knob and the antenna, just behind the headset accessories port. The PPT and emergency buttons are set into a grip indentation on the left side of the unit with the flashlight switch just outside the indentation halfway to the power knob. The flashlight is nice and bright. The flashlight is an independent feature of the handset so you can use it when the unit is either on or off. It also stays on when pressed, which is a good feature to have in dark places. You just have to click the flashlight button once to see everything you need to see and then click the button again to turn it off. The bulb is on top of the unit. So, you can’t talk and use the flashlight at the same time, but most people will never need to use them that way either. The T460 also has a separate micro-USB power cable for each handset. That means you have to charge each handset separately. The other models have a shared charger. So, you can hook both handsets and charge them at the same time, but not with the T460. While this might not be an issue for most people, it will if you forget to plug in one of the units only to find them useless when you need them. The MT350R is a sleek radio set with yellow faceplates. It does not have a mode button, but the MT350R does come with all the other buttons and switches you find on the T460. The flashlight is also affixed to the bottom of the unit. While you will have to hold the button to use it, The MT flashlight is still an independent feature of the handsets that you can operate with the radios either on or off. The Flashlight button is affixed to the center of the left side grip with the two PPT button just above it on a ridge. The emergency button is located on top of the unit however, which moves the head accessories port to the right side of the unit. At least, you can use the flashlight while talking. While other models use an icon on the display to show when the unit is transmitting or receiving, the MT350R uses an LED above the display screen. It’s a sold red light when you are talking, and a blinking light when receiving. The display screen itself also has a red backlight instead of the usual green one seen on other models. Unlike the T460, the MT series micro-USB cable as a Y-connection to connect both handsets to the power adapter at the same time. This a vast improvement on the T4XX series since it reduces the chances that you recharge one handset and not the other. Which is the better Talkabout? 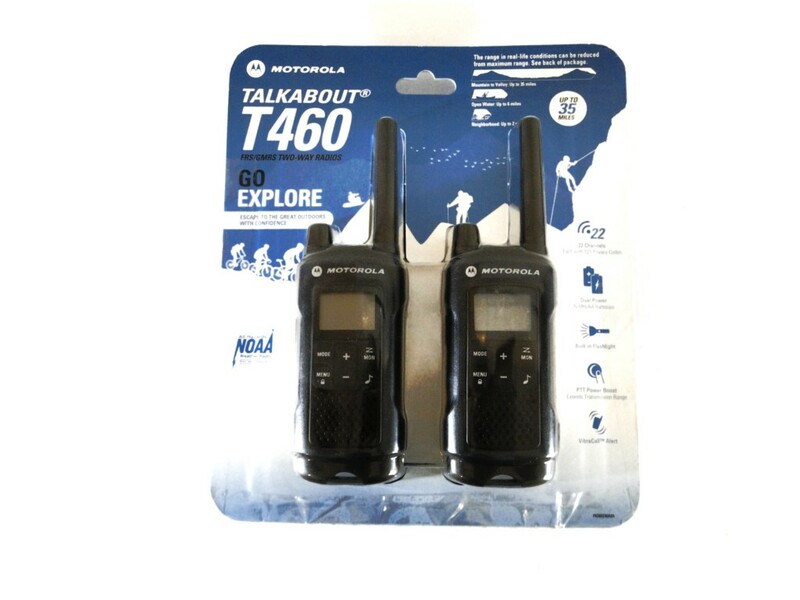 Both the MT350R and the T460 come with all the standard two-way radio features you expect. Both radios also run on rechargeable batteries, but can run on standard AA batteries if run out of charge while skiing down a mountain. The two radios also let you switch between high and low powered transmissions with separate buttons. The MT350R is bulkier than the T460, making it easier to use with gloved hands. 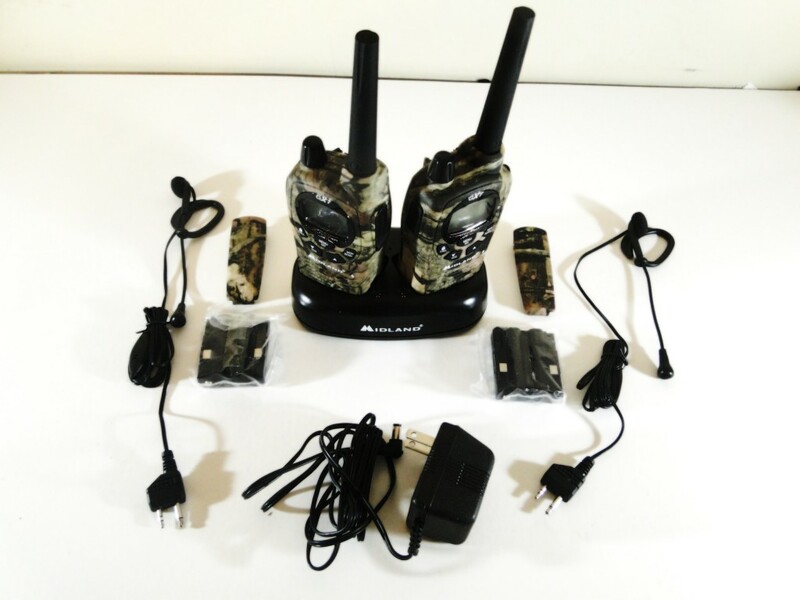 They are also burly looking, waterproof, and packed full of unique features you do not get with other radio systems including over 2500 different channel and privacy combinations that guarantee that you will find an empty channel regardless of how many other parties are in your area. The T460 has a simpler design though. It is rugged enough to handle any outdoor environment, making it perfect for biking, camping, long hikes, skiing, and other outdoor activities, but the MT350R is better suited for nighttime activities. Both radios claim up to 35 miles of transmission range, but you will most like only get only a few miles each during any normal use or conditions. Both are intuitive and simple enough for first time users, but the T460 requires less complicated tasks to reach most of its features. For instance, you just have to click the mode button to get the NOAA weather channels on the T460. That is much easier to remember than having to hold the raise volume button for a few seconds to get the same result on the MT350R. The only holding you will ever do with the T460 is the PTT button to talk and the menu button to save a preset channel frequency. Generally, the T460 is the better radio, but the ergonomic grip of the MT350R has its uses. Which Two Way radio system is better? So, which two-way radio kit should you get? These four radios come with their own unique design philosophies, and you must decide which philosophy works best for you. The Uniden radios use a compact, minimalistic design that works best with families that need to stay together but do not need a lot of the other features. These radios are great for impulse trips as well since you do not need to change their batteries. They run completely on the three AAA batteries that come with the kit allowing you just grab the kit from your local outdoors store and go. The other radio kits offer a more standard set of features. The Midland GXT 1050 does look like it was meant for hunters though. 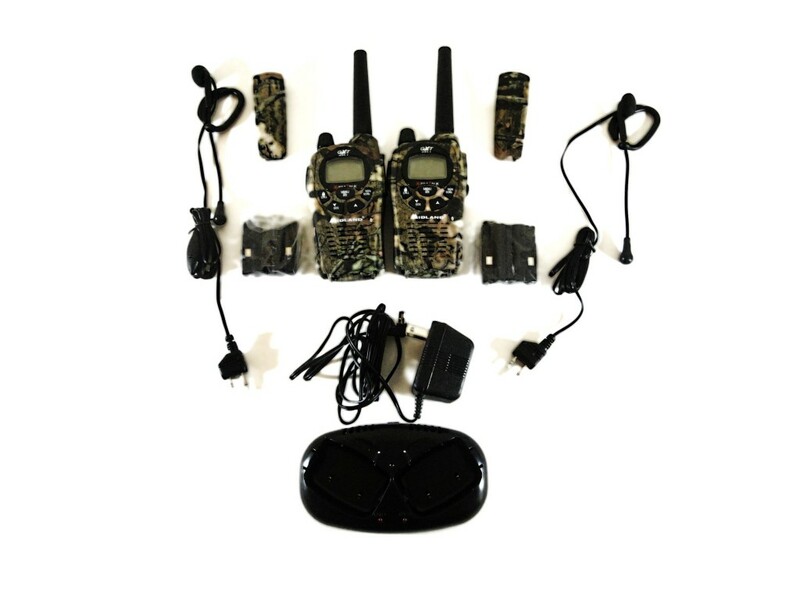 It comes with a camouflaged texture that makes it a great radio kit for when you are trying to hide from game and other animals. It make also work great during paintball fights and other military-styled events. 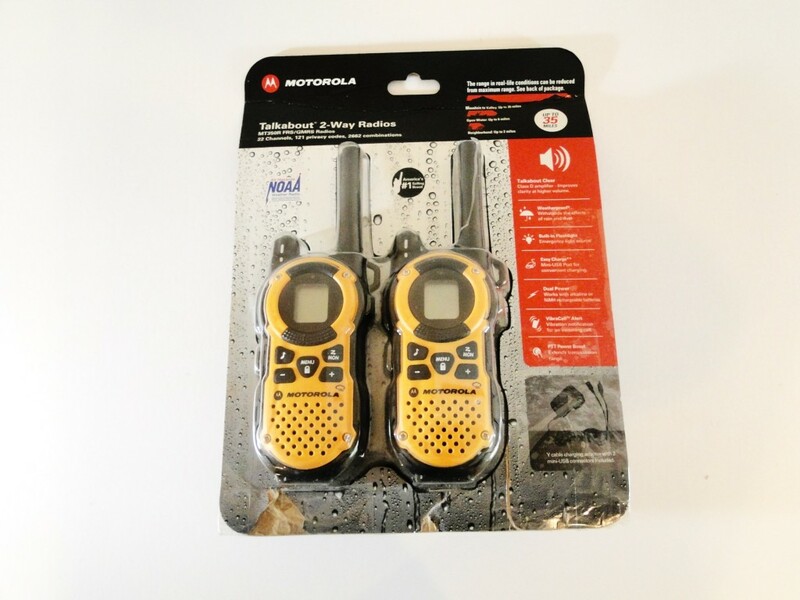 The Motorola Talk about two way radios look like your standard two-way radios. They have a basic black or yellow design that feels home in any environment. The MT350R’s yellow case makes it the best choice for outdoor activities as the bright exteriors makes them stand out in low light levels. Both units are water resistant making them great for boaters and rainy conditions. The built-in flashlights are not bad either. Either way, these four radio kits seem to work as advertised, and that makes them good deals when you need a two-way radio or two. You just need to know what you need in your radio before you choose one. 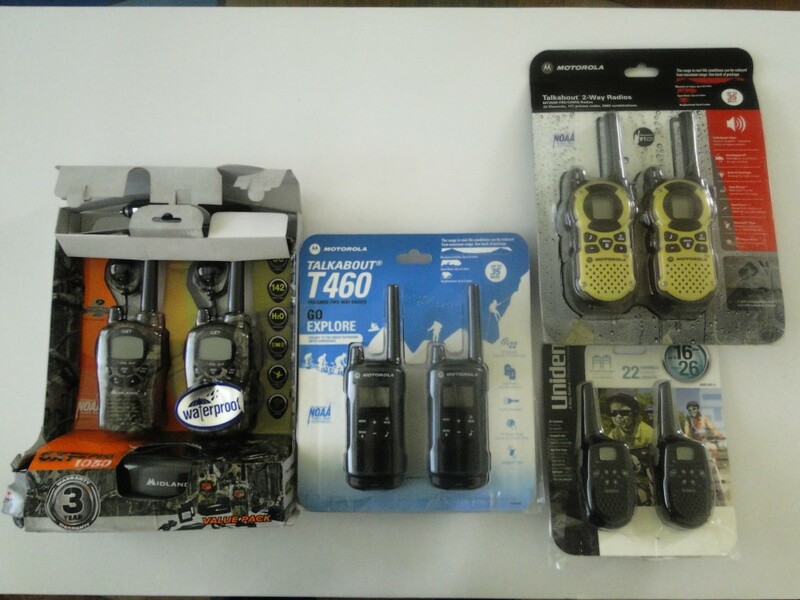 If you have kids, you might want to stick with the Uniden radios, but Motorola’s will work nicely for everyone else, though hunters will want the Midland kit. Regardless of the radios you get, you can use them to enjoy the great outdoors with the assurance that you can talk to your buddies whenever you have something to say to them.